Catania is the second largest metropolitan city of Sicily. Over the centuries, it has faced earthquakes and volcanic eruptions, it has undergone alternating dominations and urban transformations. Here it is, at the beginning of the third millennium, with its vitality and its hardworking determination, ready to surprise you and make you fall in love, submerging you in intense flavours, Baroque stuccoes of UNESCO heritage and a myriad of unforgettable surroundings. It is the most important palace in the city. It represents, in fact, the most beautiful example of Catanese baroque architecture. The building, after the earthquake of 1693, was rebuilt around 1700 by Ignazio Paternò Castello III, the fifth Prince of Biscari, and a great scholar, archaeologist and art lover, who as well as making it his home, he set up there the first major museum open to all, containing his large archaeological collection. In 1787 the prince received Goethe, who then reported in detail in his writings, the magnificence of the collections and the palace. History, charm and beauty are the words required to describe the building. 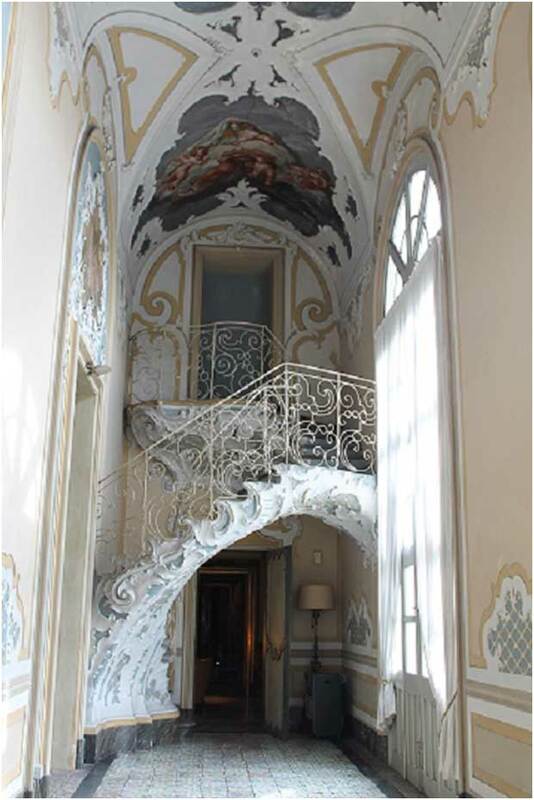 The palace is accessed through a large portal on via Museo Biscari, which leads into the central courtyard, adorned with a large double staircase. 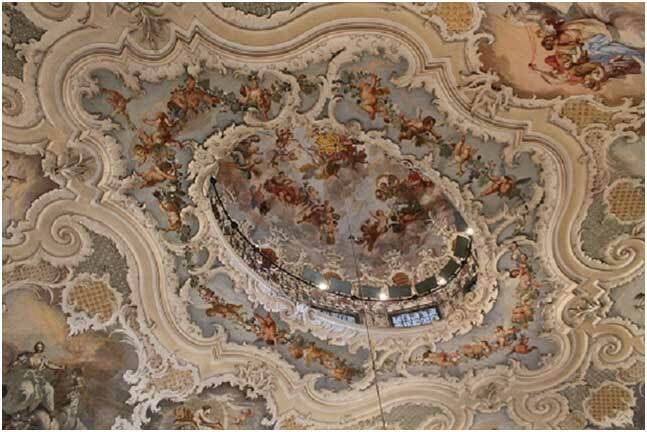 Inside, there is the “feasts hall” in rococo style, with a complex decoration of mirrors, stuccoes and frescoes. The central dome was used to house the orchestra, and is covered by a fresco depicting the glory of the Paternò Castello di Biscari family. 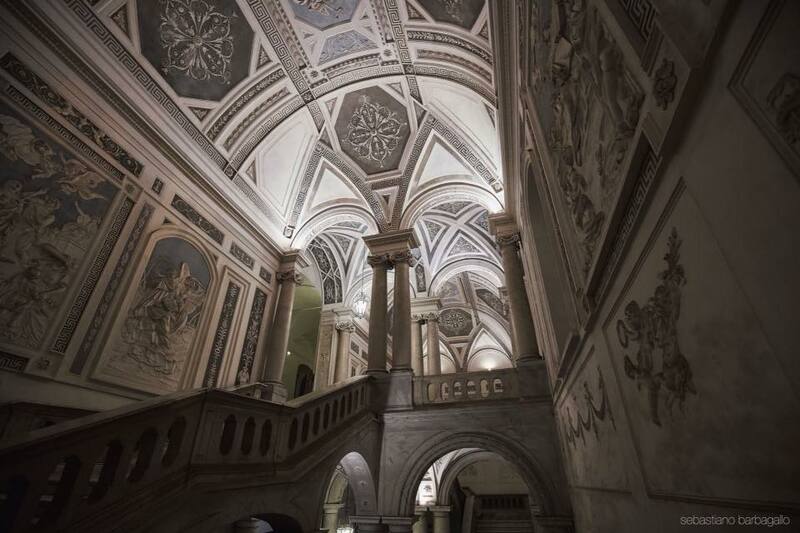 The dome is accessed through an ornate staircase decorated with stucco, that the prince Ignazio called “a trail of cloud”, within the large gallery overlooking the sea. The interior décor is in rococo style: decorations, stylish furniture, crystal chandeliers, are the details present in the various rooms, which give a touch of sophistication to the atmosphere. 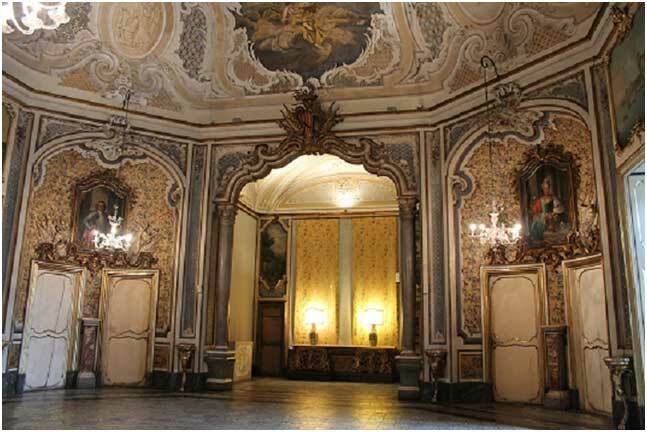 Today, besides being the home of the Biscari family, the palace hosts cultural and prestigious events. Also, with advance booking, you can visit it and be enlivened by the stories of the palace and of the family memories, from the very descendant of princes. 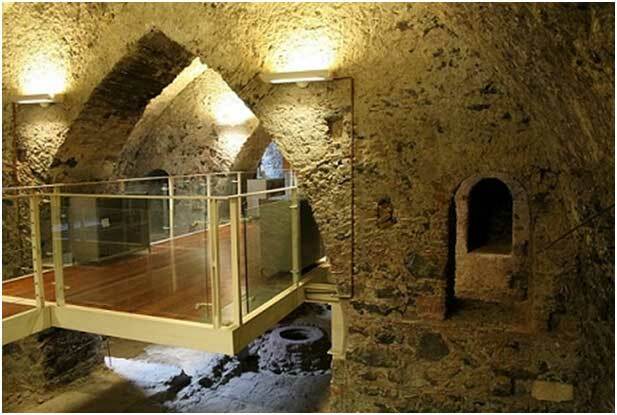 Behind the Cathedral of Catania, in the tunnel of the walls of Charles V, there is a fish market, which is partly outside and partly covered. A place where every day under large red and white awnings and on marble counters, the ritual of selling fish and also meat and fruit takes place, repeated since ancient times. The cries of the vendors, the stalls steaming with roasted peppers and tripe sold to passers-by, make this place one of the most emblematic of the city. 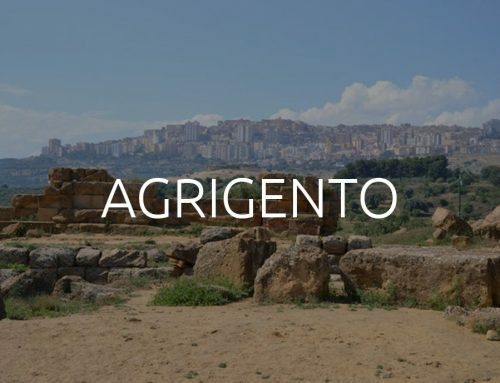 It’s the ideal place to immerse yourself in the local catanese culture and be fascinated. 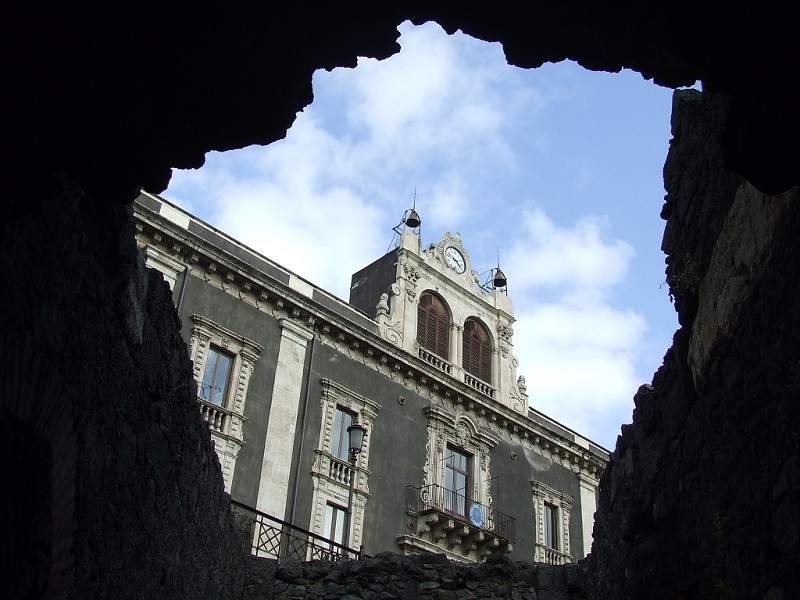 Already UNESCO heritage in the city of Catania, it was originally erected in 1355, to be rebuilt after the tragic earthquake of Val di Noto, in the early 1700s. It has since become a symbol of Catania, recognisable by the arc which opens onto via Crociferi. It is said that it was built in just one night, and that it connects the great abbey, which includes the Church of San Benedetto, the pearl of Catanese baroque architecture, to the small abbey. The small abbey is the home of the MACS – the Museum of Contemporary Art in Sicily. The Contemporary Art Museum – Museo di Arte Contemporanea Sicilia – MACS – located in the small abbey of the Monastery. 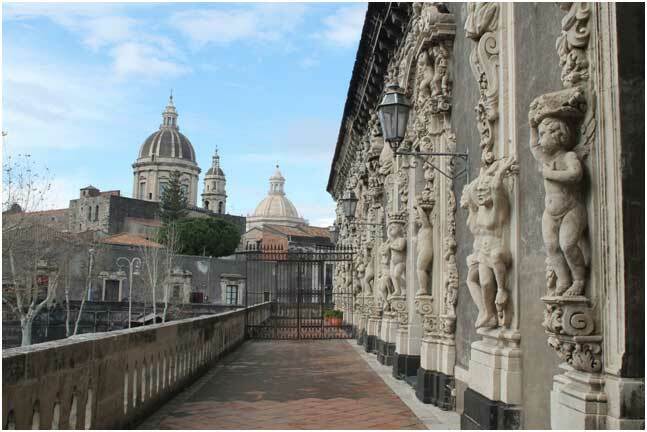 A 10-minute walk from Catania Cathedral is the monastery of San Nicolò l’Arena, a jewel of the late Sicilian Baroque style, it is one of the largest Benedictine buildings in Europe. The monastic building, which was founded in the 1500’s and has developed up to today, is an example of architectural integration throughout the periods, marked by multiple transformations. Today it is a UNESCO World Heritage Site. Home to the DiSUM (Department of Humanities) at the University of Catania, it holds within it a Roman domus, cloisters and a beautiful roof garden. 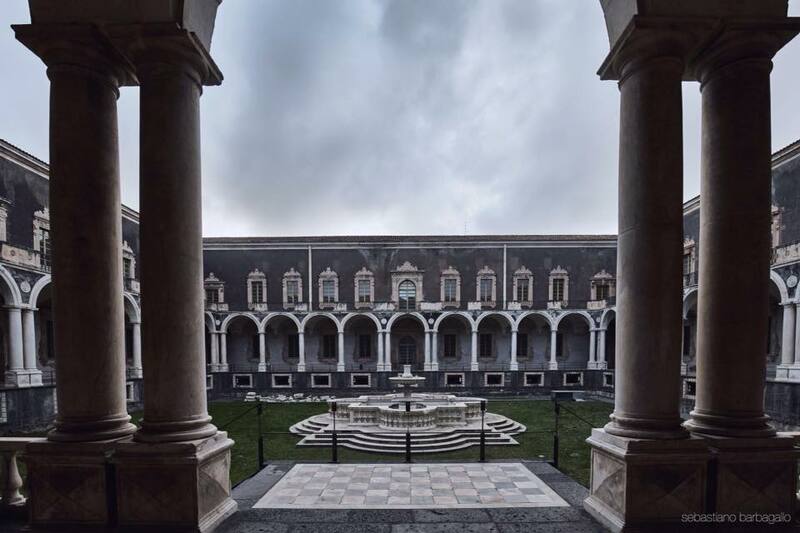 The Monastery is a unique place that tells about the human and historic events of the city on the slope at the foot of Etna, from the ancient times until today. The monument is open everyday, for everybody with guided tours also in unusual times, theatrical and musical performances, children’s workshops, cooking classes, workshops and many events. Find out how to visit, know and experience one of the largest Monastery of Europe. They are an old and current attraction of Catania. To drink “u cioscu” (at the kiosk) represents a meeting place with a neighbourhood identity, with a history, that of Catania. A place for refreshments and meetings day and night, for all ages, the symbol of the daily life of this city. 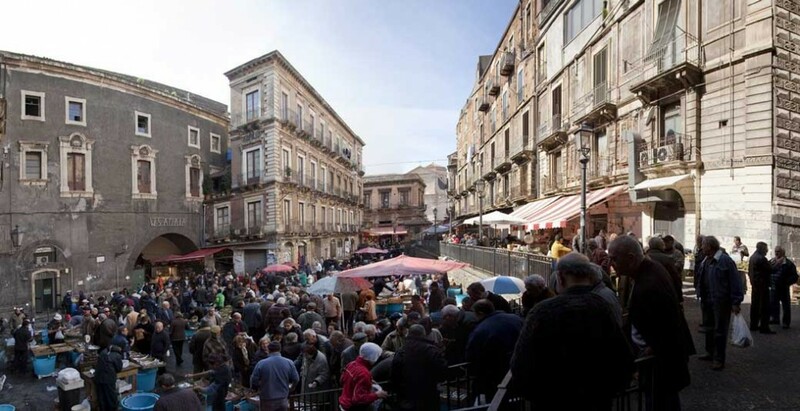 There are the stands at piazza Roma square, in piazza Cavour, in piazza della Borsa, to name those in the centre but the most famous are those of Piazza Umberto, a stone’s throw away from the fera o’ luni, the market of Catania. The history of the kiosks dates back to the 1800’s when in Catania, street vendors offered a drink “water and zammù”, i.e. water with a few drops of anise, to refresh and quench the people of Catania during hot weather. The ingredients and instruments are the same as always: sugar, fruit, mixers, cups, measuring cups and presses to squeeze the citrus fruits. Today, sparkling water coming from the slopes of Etna is added to the mineral water, and to the syrups and soda water. 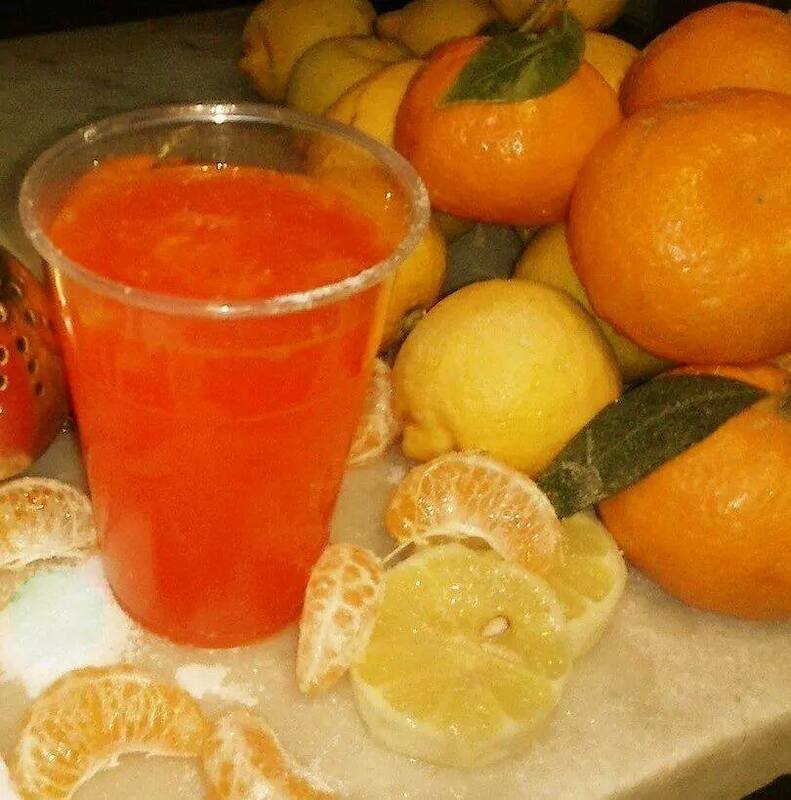 Often they are the same Catanese “cioscari” that produce Sicilian citrus fruit syrups for making drinks with mandarin, tamarind, the famous orzata (orgeat) syrup, or the famous “sciampagnino” (citron juice with water and soda water), and the “completo” (orzata, fresh lemon juice, anise and soda water). It is the traditional drink made with freshly squeezed lemon juice, with the addition of soda water and a generous dollop of salt: the effect is highly refreshing and aids digestion. How many wonders are hidden under the city! Mount Etna, with its rivers of lava, has engulfed Catania several times, burying signs of its past but they still remain hidden under the surface. 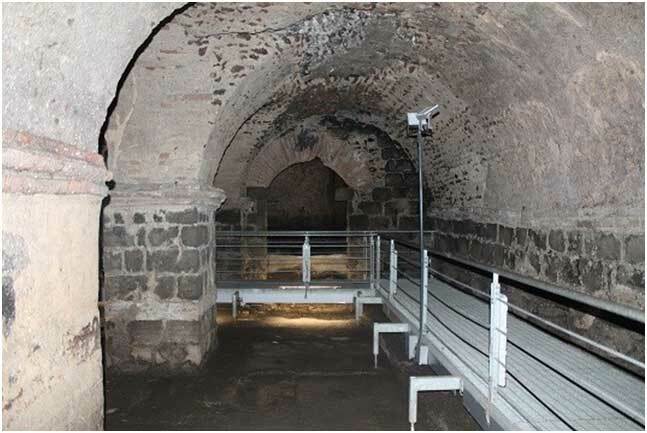 The Achillee Thermal Baths, the Spas of Indirizzo, of Rotonda, the Roman Amphitheatre, one of the largest of the Roman period in Italy, second only to the amphitheater Flavio Rome (Colosseum), and that of Verona; the church of S. Gaetano alle Grotte, whose date is still a mystery today, with its underground tunnels, perhaps once used as catacombs, where it is believed he was buried the body of St. Agathathe; Benedictine Monastery and its “belly”, the Decumanus Maximus, the Roman Domus and even the kitchens of the Benedictines; the Tomb of S.Euplio, the ingrottamento dell’Amenano, the Roman Hypogeum also said “Hypogeum square”, the Well of Gammazita and its fascinating legend, the Crypt and wash houses of S. Agata la Vetere the first cathedral in the city, where the martyr suffered removal of the udder, the Baths of the Gladiators at S.Agata al Carcere and the Bonajuto Chapel, Bizantine monument immersed in the heart of Catanese Baroque. 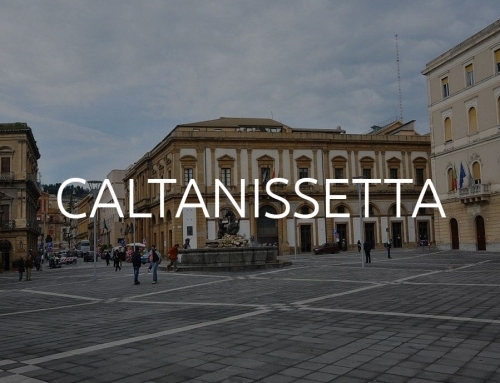 In short, under the “basule” of Catania still extend layers of ash that recall the ancient history of this city, with its streets, churches, baths, palaces and even the street signs. 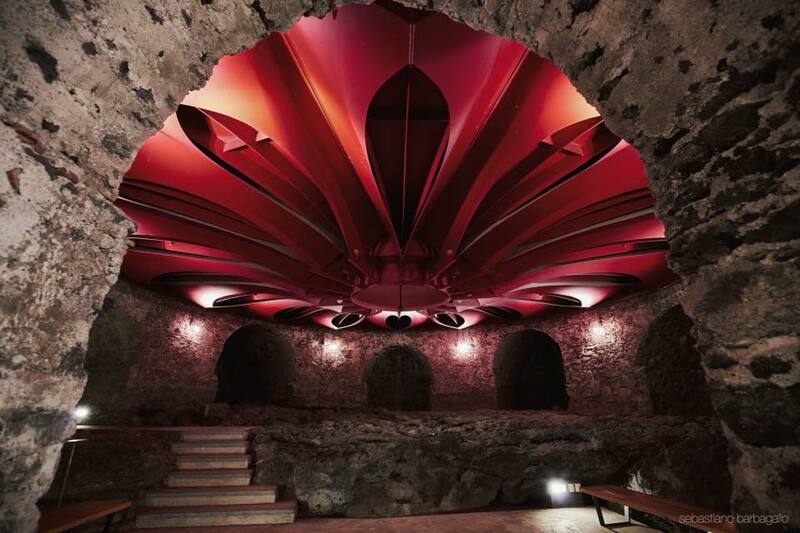 In many places you can go down into the underground, which has reportedly witnessed love affairs between nuns and friars, been a hideout of brigands and holds treasure for lovers of artistic things. 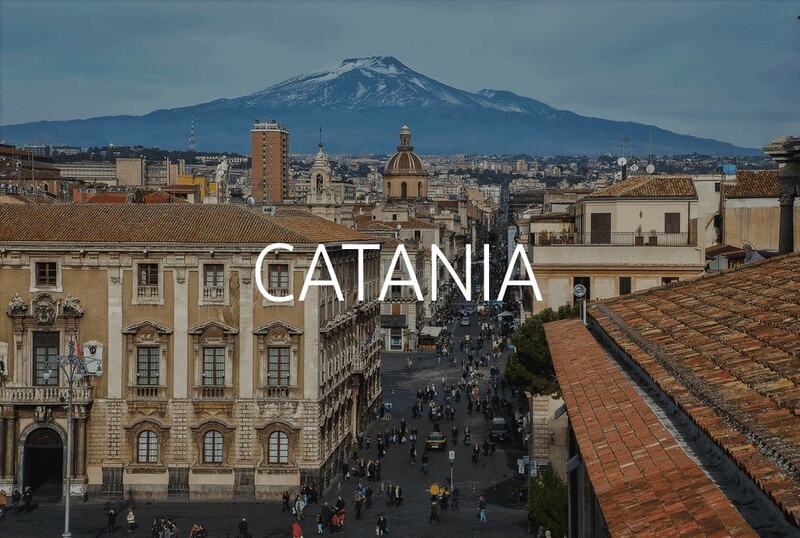 On 3, 4 and 5 February, three days of worship, of intense faith and animated folklore, preceded by a month of great preparations, during which Catania gets closer to its Saint. This is the celebration of Saint Agatha, the third religious festival in the world for participation of the faithful, after the Holy Week in Seville, Spain, and the feast of Corpus Christi in Cuzco in Peru. Over those three days, the city forgets everything to concentrate on the celebration that attracts each year – between devotees and visitors – up to one million people. 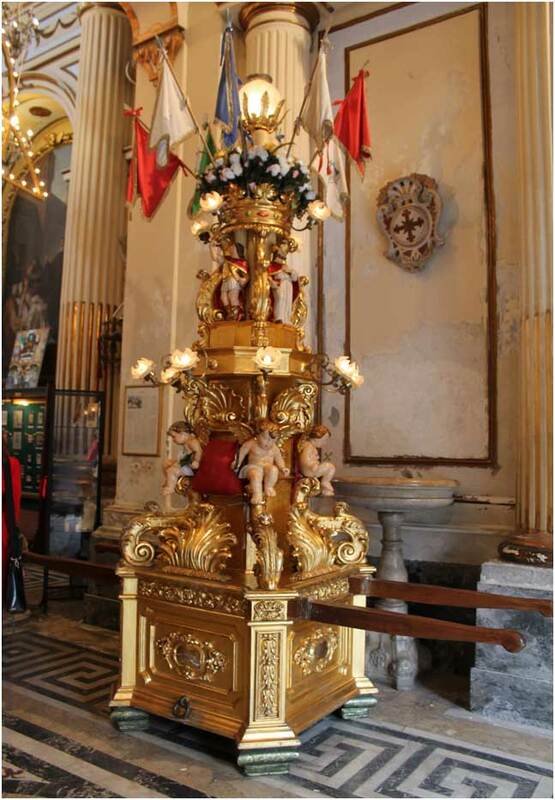 The procession goes through the places of martyrdom and the oldest road layout of the city through the parades of the “candelore”, monumental and richly decorated candlesticks, brought heavily shouldered by devotees in traditional white “sackcloth”, shouting “All devotees all, Citizens, long live Saint Agatha”. 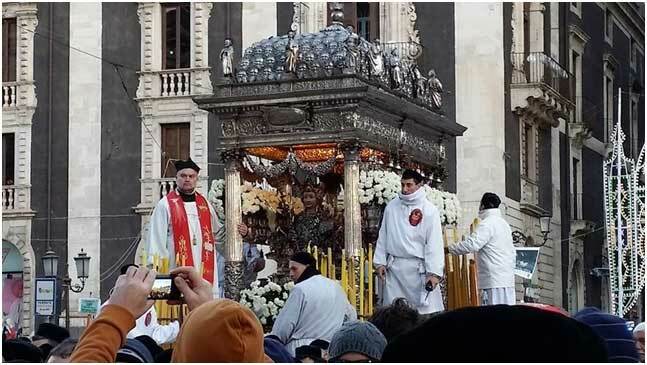 And even now, the exit in procession of the “vara” – a masterpiece of art made by master goldsmiths from Catania and Messina – containing the sacred relics of the martyr, the parade of carriages of the Senate and finally the spectacular fireworks, remind us that Saint Agatha is always there to oversee the fire of Etna. 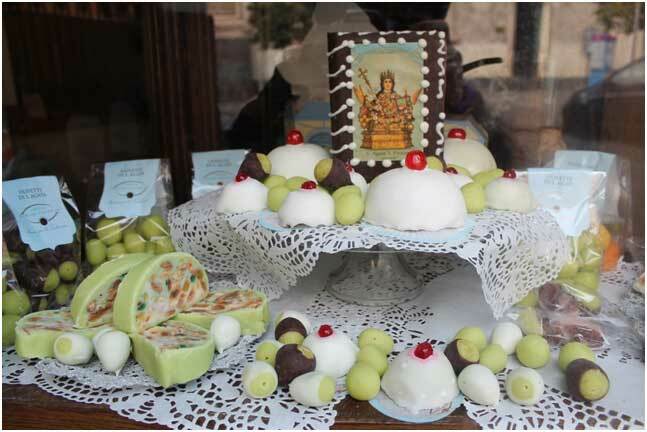 In the counters of all the Catanese pastry shops cakes connected to the history of the virgin, patron saint of Catania cannot be missed: the “Cassateddi of Sant’Aita” also called “Minni of Sant’Aita” and the “Olivette”. The first relates to the martyrdom and to the brutal tearing of the breasts to which the young girl was subjected, by the Roman emperor Quinziano for refusing his love and for having decided to devote her life to the Christian faith. The olivette, instead, refer to the legend where a young man, cherished by people of Quinziano, in stopping to rest and by bending down to tie a shoe, he saw arise from nowhere the olive tree that shielded him from the view of guards and gave him fruits to eat. 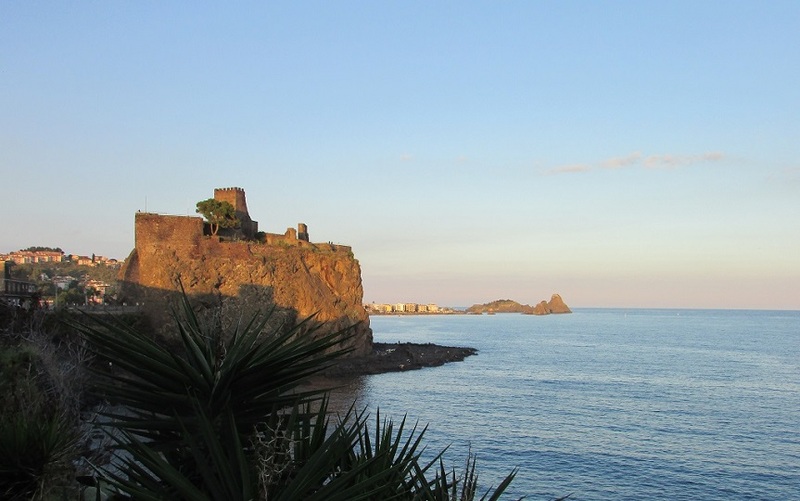 A route between nature and history close to the city, a charming itinerary along the small seaside villages facing the Ionian coast of Etna. From San Giovanni Li Cuti and the small port of Ognina to Acitrezza, passing through Acicastello and, in the area of Acireale, from Capomulini to Santa Maria La Scala, crossing through the beautiful Nature reserve of Timpa with the evocative and silent Chiazzette and the hamlet of Santa Caterina, from which you can enjoy a beautiful view overlooking the sea. 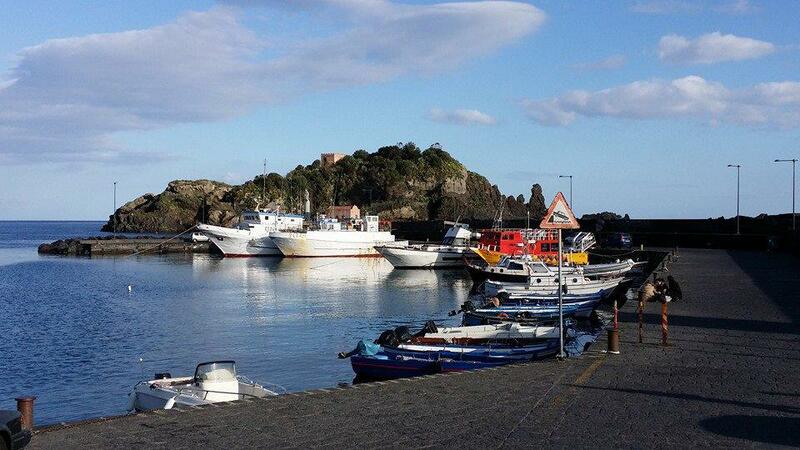 And again from Scillichenti to Riposto, calling at the seaside villages of Stazzo, Pozzillo and Torre Archirafi: a fascinating journey along the Borghi della lava (villages of the lava), enhanced and made unique by breathtaking views, sensations, curiosities, typical scents and flavours of our Mediterranean spot. Spend a day on board a fishing vessel in the high seas alongside fishermen. Experience the calm waters, the coastal environment and the secrets hidden in the depths of the sea. Enjoy freshly caught fish on board or ashore, in one of the multicoloured seaside hamlets. Rediscover traditional local recipes and swim in places inaccessible by land, discovering small gems of nature. On summer evenings, after a long day under the umbrella at the beach, what could be better than extending the relaxation in these “corners” of the city centre, looking for a bit of cool. The film that you missed seeing during the winter will be projected on the large cloth screen in a jasmine-scented courtyard with near perfect sound. 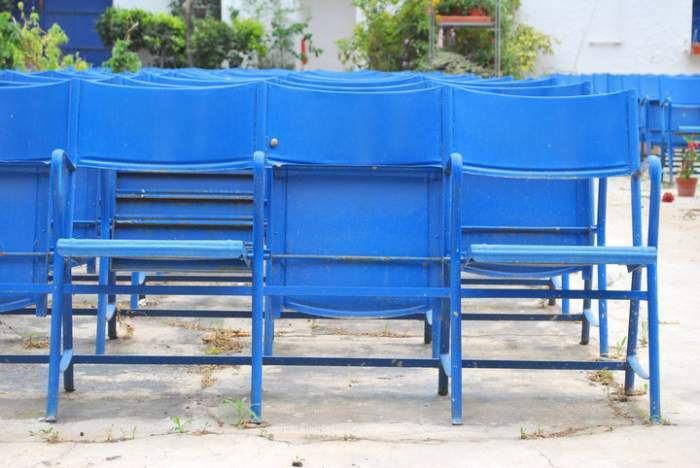 The vintage setting is rounded off with rows of blue chairs, strictly made of iron but luckily the modest cost of the entrance ticket also includes the cushion. To top it off, the real Catania style includes “lemonade and Semenza seeds”. This extraordinary nature reserve, has been included in 2013 as a World Heritage site by UNESCO as one of the “most active and emblematic volcanoes in the world”. 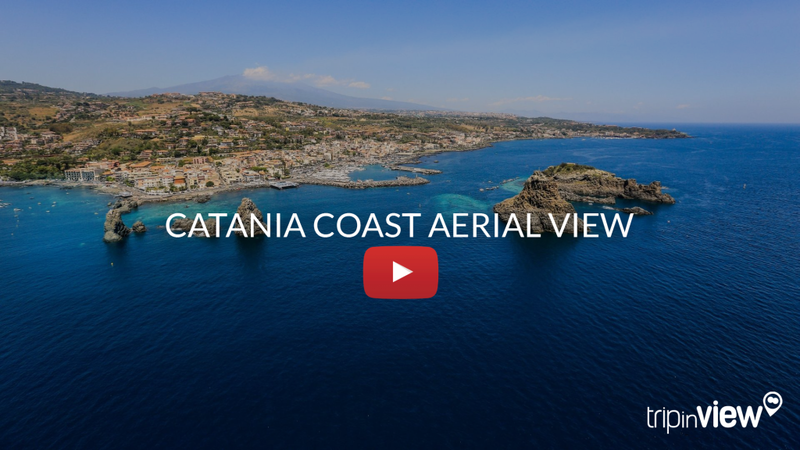 Already when landing on the runway at the Fontanarossa Airport of Catania, you cannot help notice it: Mount Etna, the highest active volcano in Europe, between the rivers of Alcantara and Simeto, with its mass dominating the whole of Sicily. Its spectacular eruptions, the fiery lava flows, has always aroused the interest of scientists and the curiosity of visitors from all over the world. An exclusive destination for summer hikers are the visits to the active craters in the summit areas. However, this Volcano also offers the surprising opportunity in winter of practising, just a few kilometres from the sea, winter sports, with breathtaking views of the Ionian Sea. 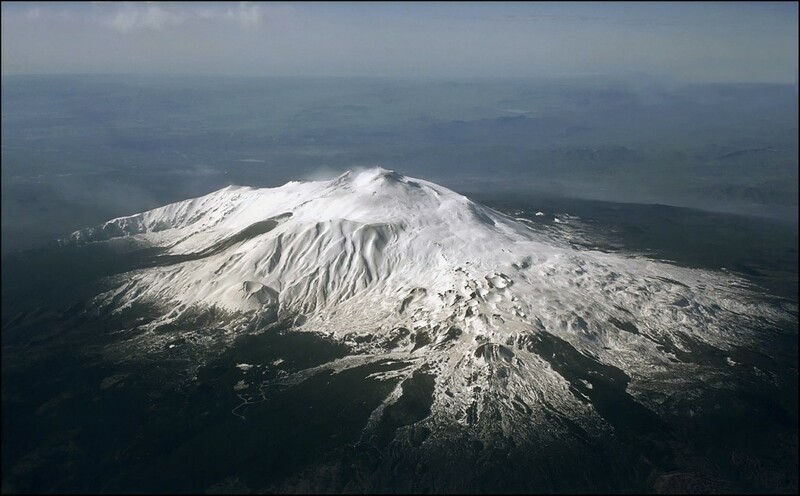 Walking tours climb along the trails of the Park of Etna, through forests and lush fruit orchards, up to higher altitudes with fascinating views of lunar landscapes, centuries-old lava flows, caves and active fumaroles, revealing the charm of this area.